It has been a busy week for RUVIVAL! Just as we published our first RUVIVAL Book last week, we headed to the 2017 Campus Innovation Conference here in Hamburg. Together with our colleagues from the Library of Hamburg University of Technology and Hamburg Open Online University we discussed topics related to Open Access and the translation challenges by producing Open Educational Resources (OERs) in two workshops. We discussed open access in relations to Open Educational Resources with Thomas Hapke from the Library. The communication and translation challenges were discussed in relation to flight and migration with the two HOOU Projects: Hop-On (link in German), providing information for educational opportunities to migrants and Project Management in Urban Design, an architecture project on building community houses with students, pupils and refugees. These two topics are of particular importance for us because, as an Open Access e-learning project, we strive to help restoring degraded areas and creating new, not just inhabitable, but liveable spaces by producing knowledge to empower local communities all over the world to increase their living conditions. Fresh with impressions from Campus Innovation, we were off to the OERcamp in Berlin. There we further discussed our Open Access strategy and presented how Master students, PhD students and researchers collaborate to create RUVIVAL Toolbox elements. We would like to thank all participants for the interesting discussions and productive feedback. We cannot think of a better way to do so than to immediately start implementing what we learned and make RUVIVAL even better! But that’s not all! More good news this week came from our partner project, the Slope Farming Project in Arba Minch Ethiopia , who won the first prize at the 5th Harburg Sustainability Awards! The prize money will go into further implementing the measures to make a long-lasting, sustainable change in Arba Minch. Congratulaitons! 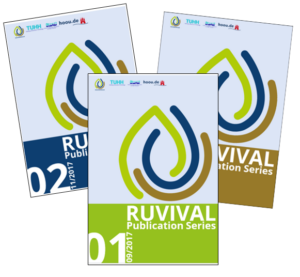 ⟵The first RUVIVAL Book is out!